provides 360° cooling efficiency and splash lubrication for total reliability. A cooling fan helps to provides maximum forced air-cooling for ultimate efficiency. A large pump that puts out little noise and a lot of power is due to the slower RPM speed and efficient two-stage design. Because they operate at slower speeds than other compressors and feature large-diameter finned copper tubing between stages, they have a lower operating temperature, which achieves maximum efficiency. Any piece of equipment that runs from air power, (such as air tools) require a certain volume of air to operate them. The volume of air that a compressor produces is rated in CFM (Cubic Feet per Minute). You usually see several CFM ratings at different pressures on a compressor. CFM ratings can be exaggerated just like HP ratings, but you should get around 3½ – 4 CFM per real HP at 90 PSI. producing as much air as you want to use, you’ll never run out of air no matter how small the tank is. 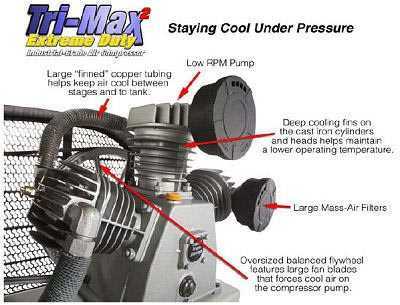 A smaller tank is more portable and gets up to pressure quicker, while a compressor with a large tank doesn’t start and stop as often and cools the air better. Having a larger tank doesn’t mean the compressor runs less, it starts and stops less frequently but the running time is the same as if it had a smaller tank. Fantastic writing. Looking forward to more.